Plus, of course, there’s all the stuff that would happen if “the feminists” got their way, along with his definition of real feminism vs. fake feminism. Hint: it’s real if he doesn’t have to deal with it directly because these women are in other countries, or are dead. Or, ideally I suppose, both. In short: the world according to Gary is that third wave feminists are not real feminists because they allegedly don’t focus on the topics Gary would like them to (namely — the issues that men and boys face, along with “important” topics like stuff happening in the Middle East or Africa, rather than on Instagram because lol women are vain). The feminists who do focus on those topics, whose work I have read, evidently don’t exist — which came as a huge surprise to me, but oh well. Other people who don’t exist: Any segment of the LGBTQ+ community, people of color*, people who were alive during first and second wave feminism and still call themselves feminists, and — of course — feminists who do advocate for men and boys. 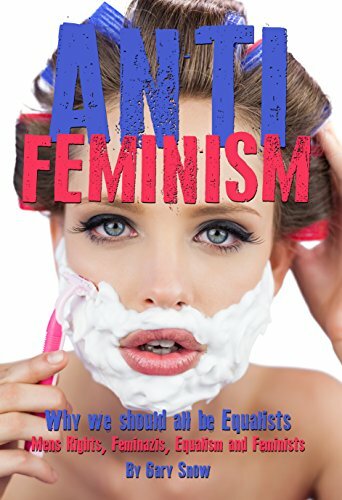 If you’ve read any Men’s Rights blog or MRA thread on Reddit, then you’ve already heard every argument this book has to offer. Except, ironically, many of the MRAs I’ve encountered online have actually bothered to back up their statement with some kind of citation, even if the facts are misleading and cherry-picked. Oh, and it’s littered with embarrassing typos. Men have to make custardy payments? How much custard are these dastardly feminists eating?!!?!? ← Anyone else watching Westworld through a lens of miserable apathy?